I can’t believe that Thanksgiving (my favorite holiday of the year) has already come and gone. We had a lovely visit and feast with Howard’s sister and her family in New Jersey. Everything was delicious. I have some turkey stock stashed in the freezer that I made from the carcass, but otherwise, the leftovers are all gone. After all the rich food and restaurant eating that goes with visiting, this week’s recipe for Cook the Book Fridays, the very French Grated Carrot Salad (or Carottes Râpées), is a perfect addition to a healthier diet for the week. Not only is it good for you, it is also super simple to put together. Grated carrots are tossed with a lemony vinaigrette and some fresh chopped herbs. That’s it, that’s all. They’re great! In fact, this recipe is so easy, that I forgot to take any pictures! I used carrots that I bought from Lexington Community Farm at the end of the season. These are carrots that I helped weed throughout their growing season, so they are particularly special to me. I’ve made salads like this occasionally, and this time around, it leaves me wondering why this salad isn’t a regular visitor to my kitchen. I went back to compare this recipe from David Lebovitz’s My Paris Kitchen to the one I made from Dorie Greenspan’s Around the French Table. David’s recipe uses much less dressing, for a dried (though not dry), salad. I also loved the brightness of the fresh lemon juice. Dorie’s recipe uses a lot more Dijon mustard. I think when I revisit this recipe, I’ll add more mustard to David’s dressing for a bit more bite. Other than that, I hope to prepare this one again throughout the year. To see what other bloggers in our group thought of their carrot salads, check out their links here. To make your own carrot salad, you can find the recipe on page 123 in David Lebovitz’s My Paris Kitchen or on-line here. Quick note to the Doristas among you: I’m so excited about tonight when I’m going to one of Dorie’s local book signing events. I postponed getting my own copy of Dorie’s Cookies in anticipation of a signed copy. Just as exciting, Cher of The not so exciting adventures of a dabbler… will be joining me on this Dorie field trip. Posted on 2 December 2016, in Cook The Book Fridays, my paris kitchen, Salads and tagged carrots, Cook The Book Fridays, my paris kitchen, salad. Bookmark the permalink. 8 Comments. This was good as David directed it, but it was a bit too dry for us. I eventually added a bit of oil and vinegar to spruce it up. Very simple recipe, reminds me of having a bowl of coleslaw around. No mayo involved, and lasts. We didn’t like this one as much as you did, but I partially blame my old lemon. I also like your idea of adding a bit more Dijon mustard. Have fun tonight with Dorie and Cher! Thanks for a simple salad like this. One ingredient and everyone’s happy! Enjoy your meeting with Dorie! Looking forward to seeing and hearing about your get-together with Cher and Dorie. I haven’t gotten the book yet. Thought I would order it when I get to Cali so I didn’t have to transport it from Aspen. Now I understand why I added more mustard to David’s recipe. I just think his recipe needed more punch. Probably thinking about the taste of Dorie’s (which, admittedly, I like better). That photo of the carrots was enough for this post. 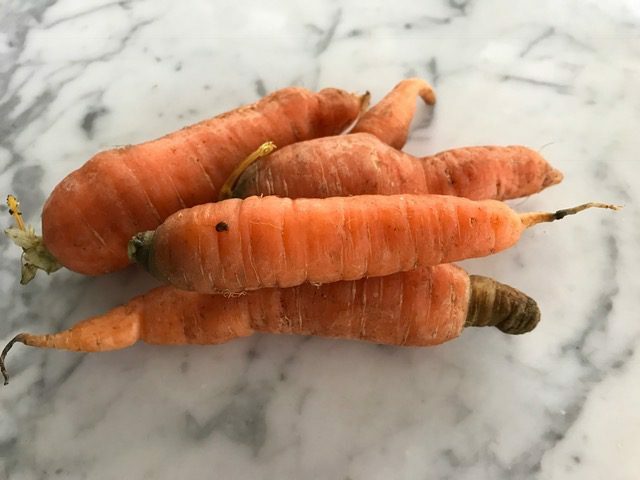 There is nothing that beats a home-grown carrot. Betsy, first thing first.. I need you to shout out to Dorie that in Kuala Lumpur, Malaysia – two copies of her Dorie’s Cookies book arrived! All thanks to Joyce of Kitchen Flavors! Grated? I prefer ‘freshly grated’, hence made this twice already – short order style! but with the dressing on standby in the fridge! Heyyyy, where’s the photos (on FB)?? Did I miss them? How cool that you got to see Dorie and Cher!! I liked this salad, too, though I did add some vinegar for brightness. Super different from Dorie’s, in its way, but still has its place. Happy December, Betsy! We’ve enjoyed this salad, and I did add a little more dressing. Enjoy your Dorie field trip! So jealous!